I am on vacation this week. 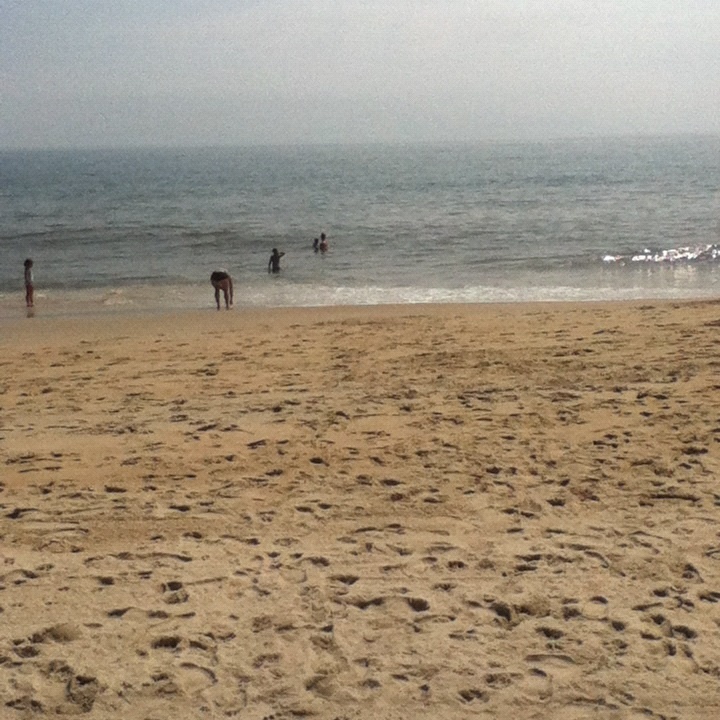 At the beach. Which does not mean, at all, by any account, that my home is standing empty. Although it did mean that my neighbor contacted me to let me know that our garage door was open. Gaping open, to be exact, while I was several hundred miles away. Which does not mean, at all, by any account, that my house was empty AND wide open. So let's get that straight, in case any of my scores of readers think it's a sitting duck. Phew. It's good to go on vacation. Vacation is where you can relax. Which does not mean, at all, by any means, that I do relax on vacation. But I can try. 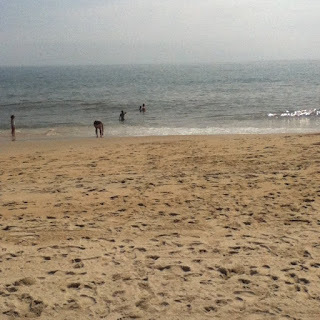 One of the things I did on my vacation yesterday afternoon was stare at the backs of the husband and the 13-year-old and the 10-year-old as they were bobbing up and down in a rather choppy ocean, diving through wave after wave after wave, as the water roiled around them. I was holding a novel on my lap, but I was not reading it. It was, in fact, digging into my stomach, as I leaned forward, trying to will the husband to decide enough was enough, the water was rough, and it was time to return to shore. This was not relaxing, even though it qualifies as "on vacation." However, it was instructive, readers, and I will pass on my knowledge to you. While I was attempting telepathically to get the husband to make this decision, I was also thinking about Heidi Grant Halvorson, Ph.D. Yes, I know. Crazy, right? I was multitasking. What I was thinking about was her discussion of promotion goals and prevention goals. Promotion goals have to do with--no surprise here, if you know your Latin--goals that move you forward, goals that push boundaries. Prevention goals are about staying within parameters, or in other words, about avoiding bad outcomes. Such as your child's breaking her neck in a bad tumble in a rough sea. Such as your child being scarred for life by being swept away by a rip tide and having to be rescued by a lifeguard. Or your child not being rescued. As I sat, the edge of The Flight of Gemma Hardy, which is an excellent book, by the way, jammed into my belly, I saw with great clarity that I tend towards prevention goals. The good news here is that that is okay. The good news is that it can be just fine to be prevention-minded. The world needs people like me, with prevention goals dominant. We're the pragmatic types who figure out what can go wrong and remember to bring umbrellas and mad money. But the really great news is that it's okay to be a worrywort, especially if you work, say, in a nuclear power plant and are in charge of safety checklists and such. Which I do not, but nevermind. It's also true that the world needs promotion-goal oriented people, too. In this case, that was the husband, who was allowing the 13 yo and the 10 yo to experience a lot of fun in the wild and dangerous sea. And the world needs promotion-goal oriented people to give the prevention-goal oriented folks something to work on, too. Which was why I eventually caught the husband's eye and gave a big time-out signal, and felt just fine about it. He, of course, said he'd been just about to say it was time to get out of the water when I gestured. Nevertheless, I felt my near apoplexy had been justified. Then I had a few moments to relax, so I returned to reading my book. It's by Margot Livesey, and is an updated Jane Eyre. The main character, Gemma, is both enamoured and wary of the sea. Overall, her goals are promotion-oriented. Otherwise, there'd be no story, readers. Otherwise, there'd be no story. Beautifully written and I'm not kidding. I'm Doing What I Want, but Where is the Money?